Hi, I'm David Barr Kirtley, host of Geek's Guide to the Galaxy, a fantasy & science fiction podcast that's produced in partnership with WIRED magazine. I'm also the author of a few dozen fantasy & science fiction short stories, which have appeared in some of the field's top books and magazines. I've always been fascinated by the sort of serious fantasy & science fiction that's based on a deep understanding of science, history, and philosophy, and that tries to foster imagination, creativity, and social progress. I'm also fascinated by the people who write fantasy & science fiction, and the techniques used to create it. 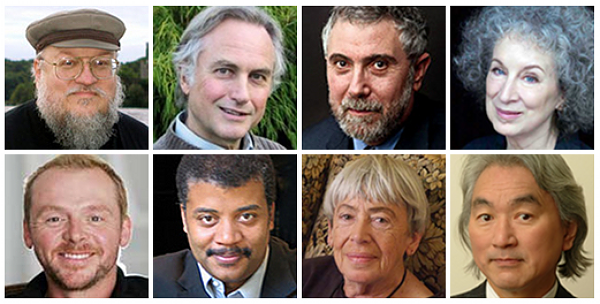 I've always thought that there should be a talk show where the world's best writers and thinkers came together to discuss all the world's most interesting and important ideas, using fantasy & science fiction as a lens for viewing the world as it is and as it might be. Back in 2010, I founded the Geek's Guide to the Galaxy podcast along with acclaimed short fiction editor John Joseph Adams, who continues to be involved as our producer and regular guest. I've spent the past five years working around the clock to build the podcast into exactly the sort of show I always wanted to listen to, the sort of show where top authors like George R. R. Martin, Neal Stephenson, and Margaret Atwood appear alongside top scientists like Richard Dawkins, Lawrence M. Krauss, and Neil deGrasse Tyson to discuss robotics, immortality, consciousness, mythology, ecology, publishing, ghost stories, and much, much more. We're often joined by top journalists, filmmakers, comic book writers, video game designers, internet stars, and astronauts -- just about everyone a science fiction fan would want to talk to, well over 100 guests in all. Doing the show eats up enormous amounts of time. Since we discuss so many books on the show, I usually have to read at least one book a week -- and sometimes two or three. John and I have to brainstorm potential guests, reach out to them, and schedule interviews. Then I have to research those guests, catch up on their recent work, read and watch existing interviews with them, and plan out the topics of conversation. I have to record the interviews and then edit them, paring them down to a manageable length and also fixing verbal fumbling and annoying clicks, pops, and background noise. I also have to write up an article about each episode so it can be featured on WIRED. I've worked full-time on the podcast, including almost every evening and almost every weekend, for the past nine years. The show doesn't bring in anywhere near enough money to pay even one full-time salary. I've kept it going by volunteering my time and digging into my savings. I've done this because I badly want a show like this to exist, and I've always believed that a show like this could be a big success. That's where you come in. Geek's Guide to the Galaxy has well over 15,000 listeners, and I get letters all the time from people who love the show and who've listened to all 300+ episodes. If just a fraction of those people would sign up to give us $1 or $2 an episode, I could easily make this my full-time job well into the future. One amazing gentleman in France loves the show so much that he's been giving us $50 a month! A few dozen super-fans like that could make the show a big financial success all by themselves. Ideally I'd like to grow our funding to the point where I could hire someone to help me with the audio editing work, which would free up time for me to record more interviews and panels. One thing that frustrates me as an author is that the fantasy & science fiction field lacks a reliable channel for publicizing new authors to a mass audience. Publishers are forced to simply publish large numbers of books for very small advances and see if anything clicks. There's a huge amount of luck involved, and most authors don't get lucky. I think it would be great if a popular talk show like Geek's Guide to the Galaxy could serve as a reliable venue for launching new writers into the public consciousness, and I think our association with WIRED and our ability to land interviews with major media figures gives us a unique opportunity to build the show into exactly that sort of platform. So if that's something you'd like to see happen, I hope you'll consider supporting us. Also, I've always been inspired by science fiction authors like Isaac Asimov and Douglas Adams who were not only entertaining writers but who also spoke out publicly on important issues like critical thinking and environmental protection. We do the same thing here on Geek's Guide to the Galaxy, and if you share our concern for those sorts of issues, I hope that's another reason you'll consider supporting us. Thanks! Geek's Guide to the Galaxy comes out once a week. The nice thing about being able to pledge "per episode" is that if we miss a week, you don't get charged for it. But if you'd prefer to pledge a fixed monthly amount, or make a one-time contribution to the show, you can do that through PayPal here. You can also make a monthly pledge through Patreon by pledging, for example, $4 per episode, and then setting your monthly max to $4. This will result in a flat monthly pledge of $4. To contribute $1 per month to Geek's Guide to the Galaxy, select this tier and make sure to set your monthly max to $1. To contribute $2 per month to Geek's Guide to the Galaxy, select this tier and make sure to set your monthly max to $2. To contribute $3 per month to Geek's Guide to the Galaxy, select this tier and make sure to set your monthly max to $3. To contribute $4 per month to Geek's Guide to the Galaxy, select this tier and make sure to set your monthly max to $4. To contribute $5 per month to Geek's Guide to the Galaxy, select this tier and make sure to set your monthly max to $5. To contribute $6 per month to Geek's Guide to the Galaxy, select this tier and make sure to set your monthly max to $6. To contribute $7 per month to Geek's Guide to the Galaxy, select this tier and make sure to set your monthly max to $7. To contribute $8 per month to Geek's Guide to the Galaxy, select this tier and make sure to set your monthly max to $8. To contribute $9 per month to Geek's Guide to the Galaxy, select this tier and make sure to set your monthly max to $9. To contribute $10 per month to Geek's Guide to the Galaxy, select this tier and make sure to set your monthly max to $10.